For so many years, we have been using Hawaiian Tropic with broad spectrum protection SPF 70, until we decided to try Neutrogena Ultra Sheer Dry Touch Sunblock SPF 55+ with Helioplex last month when we went to Boracay. Major disappointment, to say the least. I have been had by the advertisement in the beauty department where I bought it. The “dry touch” promise was the first attraction. You see, Hawaiian Tropic SPF70 is a little too greasy for me. First, there is this Helioplex® technology Neutrogena Ultra Sheer Dry Touch SPF55+ boasts of, said to be the latest breakthrough in UV protection. The Dry Touch technology is suppose to take care of excess sunscreen oils that leaves the a clean non shiny finish. Which is the very thing I would like to do away with. Which I think is the only good thing there is about this sunblock. It was not greasy. But I was out for the biggest disappointment when I left Boracay, Aklan with burnt and ultra tanned skin. Probably the tannest of tan I have ever had in my whole life. This, despite the fact that I applied it on my skin liberally every single time. Which basically explains the empty 3 fl. oz. I went home with. Truth to tell, I would not have minded the tanning part, but the painful feel of the skin is not so worth the P509 (approx. $11) I paid for. It may probably work for daily wear but to use it on the beach, I will tell anyone “NO!” in a heartbeat. At least, for me. This is true despite the fact that we were in Boracay in the perfect breezy time. The sun was unbelievably friendly. No glaring and too much of it in all the four days we were there, but still the Boracay sun did the painful burns on my skin. 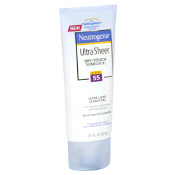 And I could not put the blame on anything else but Neutrogena Ultra Sheer Dry Touch sunblock. I religiously applied every so often and covered every exposed spot, but still this happened to me. There is no way I am going to give Neutrogena SPF 55+ another day to have me touch another tube of their sunblock ever again. I used Murad’s SPF 30 sunblock for my face in Boracay, okay naman, my face didn’t even change color. I kept re-applying also after swimming etc. i think the exact reason you disliked neutrogena sunblock is why i liked the spf protection but it still allows for tanning. I’m not sure we used the exact same product though! You should have tried VMV Armada SPF 90 🙂 I used that one in Boracay 5 years ago and I didn’t get sunburn swear and to think we walked all the way from Station two to Station one 🙂 Love VMV Armada!